Potatoes dauphine and potatoes dauphinoise are part of French cuisine and referred to as pommes dauphine and pommes dauphinoise in French. They may sound like the same thing, but in fact, they are quite different. Put simply, potatoes dauphine (pronounced "do-FEEN") are deep-fried potato puffs while potatoes dauphinoise ("do-fin-WAHZ") means baked scalloped potatoes. The story of these two potato recipes begins in the French region of Dauphiné, situated between the Alps and the Rhone Valley in southeastern France. The name Dauphiné ("DO-fee-nay") comes from the word dauphin ("DO-fan"), the French word for dolphin, owing to the fact that the family who controlled that region, before it became part of the Kingdom of France, had a dolphin on their coat of arms. Later, it became the custom for the heir apparent to the throne to receive the title of Dauphin, along with rulership of the Dauphiné region. The wife of the Dauphin was called the Dauphine ("do-FEEN"). The potatoes dauphine, sometimes referred to as dauphine potatoes, are named after the wife of the Dauphin. Pommes dauphine is classic French comfort food. Essentially a potato croquette (and sometimes nicknamed a "French tater tot"), the pommes dauphine consists of fluffy pillows of mashed potatoes mixed with choux pastry (the kind used for making cream puffs and éclairs). It is this type of pastry that makes this recipe unique. This mixture is formed into balls and then deep fried until golden brown and crispy on the outside. They are sometimes served with a dipping sauce or a simple sprinkling of course salt. Potatoes dauphinoise, on the other hand, is named not after a person (or a sea mammal), but after the Dauphiné region itself where the local cuisine is known, among other things, for featuring a wide variety of gratin-style dishes. Here in the States, we think of a gratin as anything that's baked with a layer of cheese on the top and then browned in the oven—for example, thinly sliced potatoes layered with a mixture of cream, egg, and Gruyère cheese and then baked. However, in France, the components of a traditional potatoes dauphinoise (you'll sometimes see it referred to as gratin dauphinois) are subject to neither reinterpretation nor reconfiguration. It's very much a firm, established recipe. 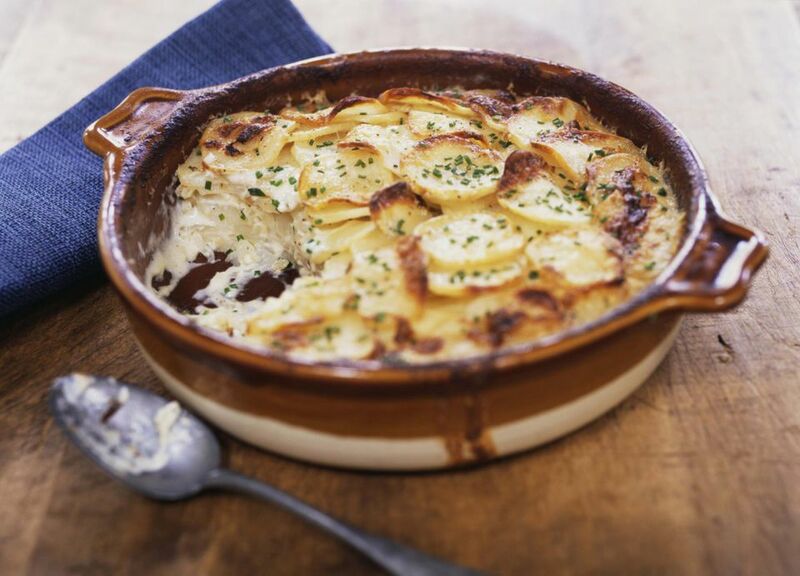 A traditional gratin dauphinois will contain neither cheese nor eggs as the starch of the potato is more than sufficient to bind the dish together. Furthermore, the addition of cheese of any kind will produce a dish that is far too rustic and considered "peasant fare." In addition, while there is no garlic in the dish, potatoes dauphinoise instructs us to rub the inside of the baking dish with a clove of garlic. Although the flavor of the garlic is meant to be subtle amidst the mild flavors of the potatoes, cream, and butter (along with a grating of fresh nutmeg), the garlic makes its presence felt. Even a small amount of cheese, especially one like Gruyére, would mask the hint of garlic.